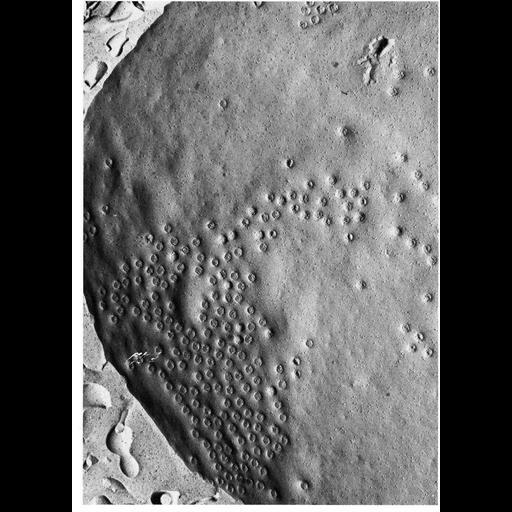 Transmission electron micrograph of surface of nuclear envelope of guinea pig spermatocyte prepared by the Freeze-fracture technique shows the unusual clustering of nuclear pores in these cells. From Fawcett and Chemes (1979) Tissue Cell 11:147-162, and reprinted with permission as Figure 150 from Chapter 4 (Nucleus) of 'The Cell, 2nd Ed.' by Don W. Fawcett M.D. A PDF copy of the accompanying chapter is available on the ASCB's BioEDUCATE website.